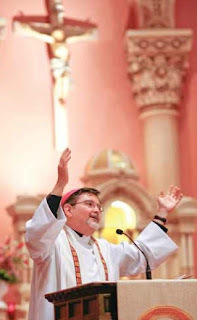 Today, the Festival Express -- 17 days, five ordinations, two installations... and a Ted with a Golden Jubilee -- heads to San Francisco for the ordination of the Bay City's new auxiliary, Bishop-elect Bill Justice. Archbishop George Niederauer will preside at the afternoon liturgy in St Mary's Cathedral making a high-hat out of his vicar for clergy, with San Fran natives Bishops John Wester of Salt Lake City and Randy Calvo of Reno serving as co-consecrators. Despite his key role in Justice's last-minute placement among the pre-PopeTrip "Appointmentpalooza" slate of five nominees, the church's highest-ranking Californian -- still known among the north-state folks as "Darth Levada" -- has sent his regrets. A son of Boston stock who marked his 40th anniversary of priesthood last weekend, the 66 year-old bishop-elect -- the 16th auxiliary in the 450,000-member archdiocese's 150-year history -- was the focus of a special edition of its weekly, Catholic San Francisco. Alongside the usual reminiscences of friends and tribute-ads from neighboring dioceses and local parishes, Justice said in an interview with the paper that, in his new role, he'd "like to challenge people on immigration and work with that and have them see we are all brothers and sisters. A nation does have the right to protect its borders, but how do we put that together without destroying the unity of families and so on? I’d also like to advocate for the right to a good education, jobs and the dignity of life from conception, and against the death penalty. Fluent in Spanish and known for his close ties to youth ministry, the goateed, youthful-looking prelate -- who paints, writes poetry and tends to roses in his spare time -- asked the people of the archdiocese to “Pray for me, be honest with me and call me forth to be of service” as he sets into his episcopal ministry. 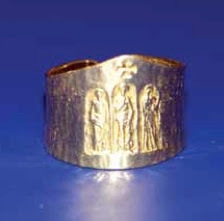 Before taking a simple, mitre-shaped "Council ring" -- a gift to the attendees of Vatican II -- for his own, one of Justice's chaplains for the ordination liturgy will be his first mentor: Fr Jim O'Malley, now 88, a parochial vicar of the bishop-elect's boyhood parish. While the retiree said the bishop-to-be "was a great kid," as he grew it became clear that "the people love him and he is always a real plus." "Bill is totally committed to Christ and the church," O'Malley added. "There is not a lazy bone in his body." 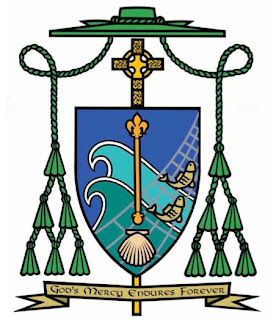 From the Golden Gate, the Express moves on to Des Moines for Bishop Richard Pates' installation tomorrow, then Denver for Friday's ordination of Auxiliary-elect Jim Conley, then to Washington for Cardinal Theodore McCarrick's 50th anniversary of priesthood Saturday night. The Pope and "Herr Professor"